one quarter cup kosher salt, plus 1 tsp. 1/4 cup kosher salt, plus 1 tsp. In a gallon-sized re-sealable plastic bag, dissolve 1/4 cup of salt, red pepper flakes and brown sugar in the water; add tenderloin. Let brine for 10–20 minutes. For Glaze: Add butter to a saucepan over medium-high heat. Once melted, add the habaneros and garlic, and sauté for 3–4 minutes. Stir in the blackberry preserves and 1 cup wine, and combine well. Simmer until reduced by half. Add corn starch and the remaining 1/4 cup red wine in a small bowl, and mix well. Remove tenderloin from the brine and pat dry. Rub the pork with the olive oil, and season with 1 tsp. salt and freshly cracked black pepper. 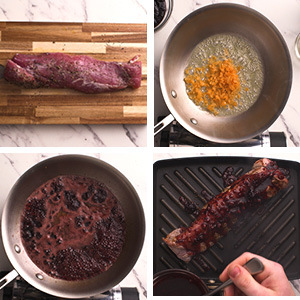 Cook the pork tenderloin for 6 minutes on each side, browning evenly (so the internal temperature registers 135° F). Evenly spread 1/4 cup of the glaze over the pork, and cook for an additional 4–5 minutes or until the internal temperature registers 145° F .
Slice the tenderloin into medallions; set on plate and pour glaze on top of your tenderloins. Serve with a smile.